As a self confessed and unashamed foodie it’s not surprising that we found our way to Nishiki market (Nishiki Ichiba 錦市場) within hours of arriving in Kyoto. 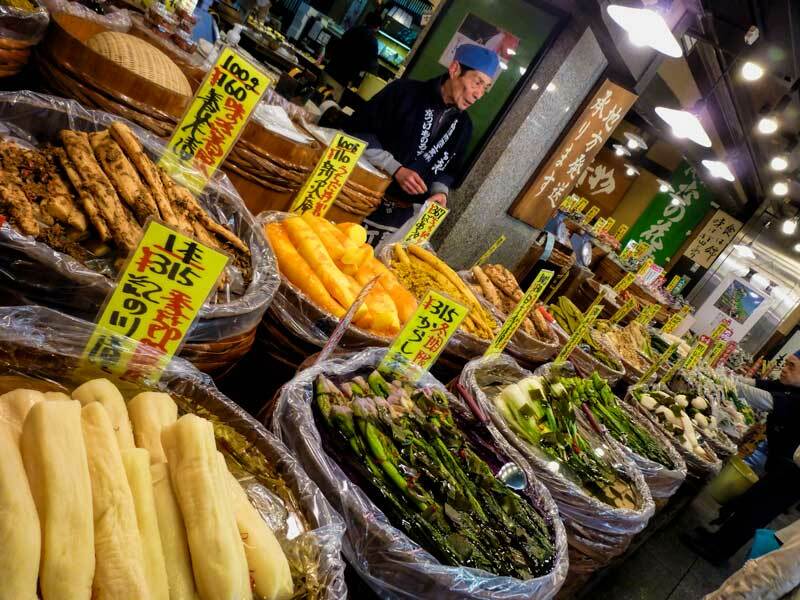 Known as Kyoto’s kitchen this is a market used extensively by locals to source fresh ingredients, artisan produce and everything you need to make traditional Japanese fare. It’s also a great place to go to get an overview of Japanese cuisine and an exposure to some food products that you might never have seen or tasted before. We last visited in April, during the busy sakura season. While the market was packed at times there appeared to be relatively few foreigners. As we browsed in each of the stores that caught our attention we were offered samples and despite our extremely limited ability to communicate in Japanese we had some great interaction with the store owners. Even when we did manage to communicate that we weren’t able to cook in our accommodation they were quite happy to engage and have you taste their produce without an expectation to purchase. I think a couple might have been secretly hoping for a more entertaining reaction from us to some of the local flavors but I thoroughly enjoyed everything we tasted and purchased. 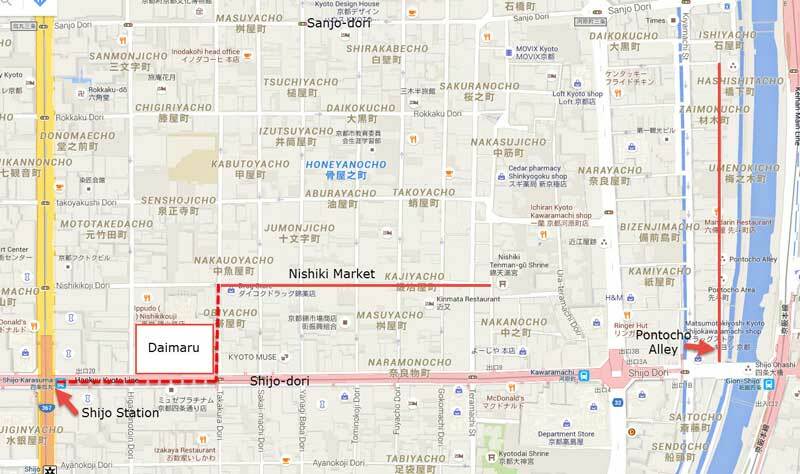 The market runs for 6 blocks (400 meters) parallel to Shijo-dori, a major shopping street in central Kyoto. To find the western end of the market walk down the alley beside Daimaru and enter on your right. Which reminds me, all foodies need to make a stop in at the basement food floor of Daimaru, it’s an experience in itself but don’t do it before the market, you must save your appetite. The far (eastern) end of the market is opposite Nishiki Tenman-gu shrine. Established in the Heian period the shrine was moved to it’s current location by Toyotomi Hideyoshi and the location marks the exact center of old Kyoto. 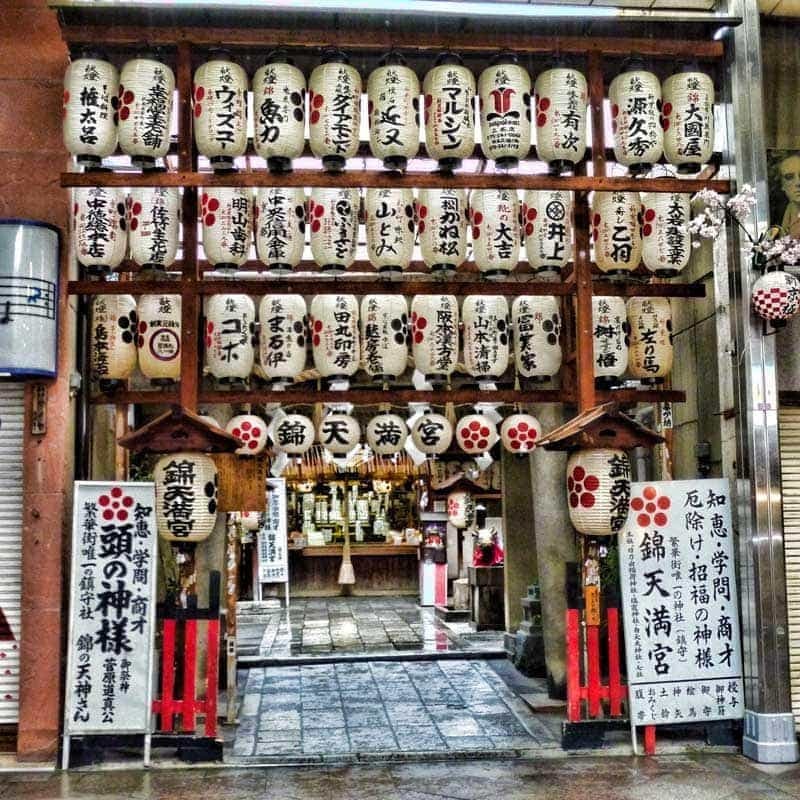 It’s a shrine dedicated to love and incorporates a number of smaller shrines within it including an Inari shrine, a sun shrine and in keeping with it’s retail location, one dedicated to commercial prosperity. Within the shrine is a well where the famous Nishiki water bubbles up from 30 meters under the ground. The water has been tested and has no smell, flavour or bacteria. There’s also a prominently placed large bronze cow and petting it’s head is said to bring success with your studies. The nearest subway station is Shijo and Nishiki market is only a couple of minutes walk from there. Shijo station is on the Karasuma line, the subway track running north – south through the city and it’s only 2 stops on from Kyoto station. Exit the station to street level and follow the dotted red line to the western entrance of the market. I’ve come to rely on some of our local markets that have been around for ages but nothing I’ve experienced before has come close to Nishiki Market. 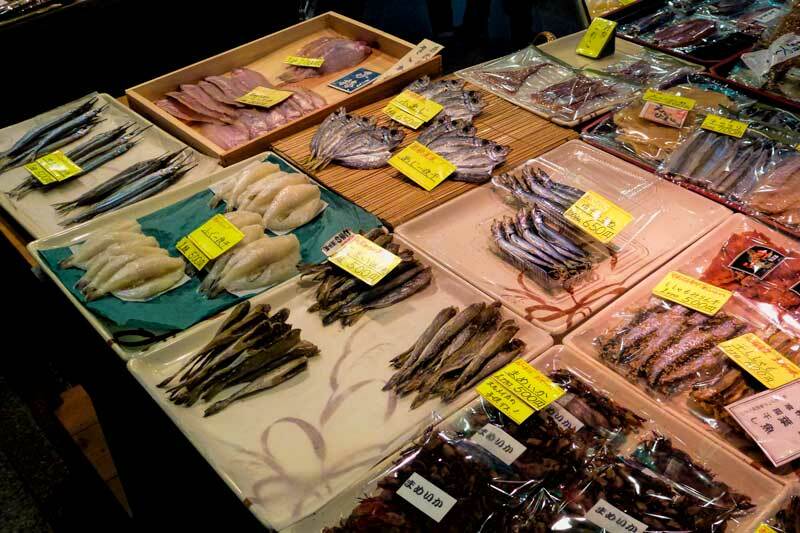 Fish has been sold on the site for around 700 years and it’s been an established market for over 400. The area is particularly suited to a fresh produce market with the springs of ground water running under this part of the city keeping it an even cool temperature even all those centuries ago before refrigeration. It’s not just the location that’s well established though, some of the stalls have been in the same family for 7 or 8 generations now. There are many great shops, stalls and restaurant along the markets stone paved route. Way too many to sample in one visit or even in several but we like to give everything our best shot. 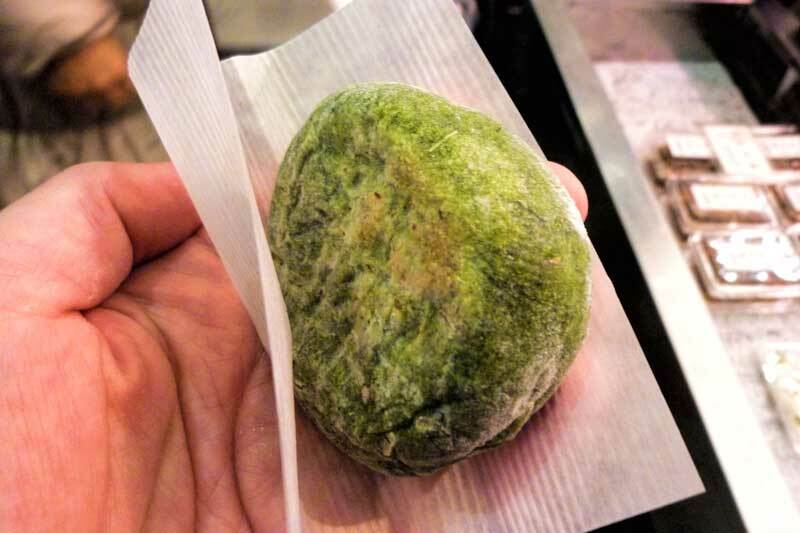 I got quite excited when I saw what I thought was charcoal grilled matcha mochi. It turned out not to be matcha at all but mugwort. It’s a herb from the daisy family that’s often taken as a tonic to boost energy. While I am a matcha fiend I wasn’t complaining, it turned out to be delicious! They grill it in front of you on a little charcoal barbecue so you know it’s fresh. Then you bite into the soft warm goey mochi to find a surprise center of sweet red bean paste. Oiishi!! I thought this was a fascinating method of preservation I’d not come across before. 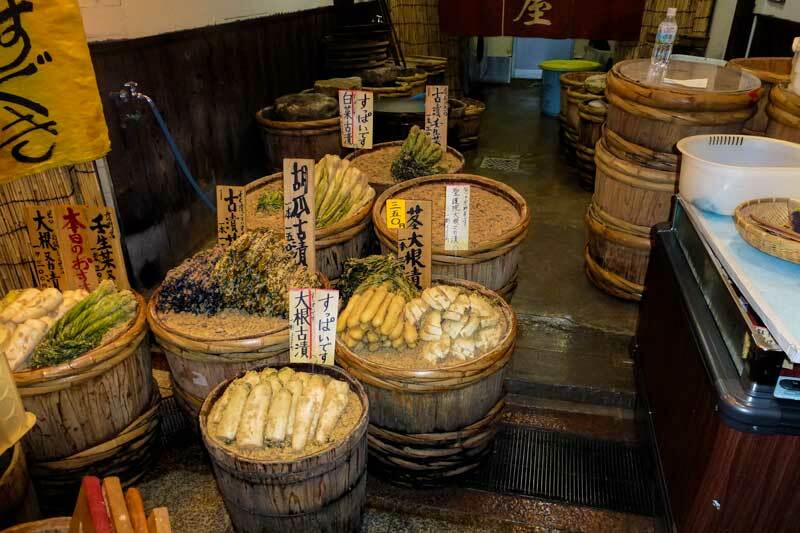 Nukazuke is a traditional style of pickled vegetables that evolved during the Edo period. Vegetables are fermented in rice bran and salt and at each store the individual recipes will give a variation in the salty and sour balance of the pickle. There were several shops offering nukazuke, not only are they delicious but it’s such a beautiful presentation. The knife shop in the market is Aritsugu and they know something about knives having been founded back in 1560! I was so tempted with some of the beautiful blades and I’ve been after a good knife for fish to finish out my set. Where better than Kyotos kitchen for the perfect sushi knife. Unfortunately I wasn’t sure of the issues bringing it back into Australia. Clearly it would need to go in stowed luggage but I really wished I’d done some research first. I’d heard of swords and daggers being confiscated but I had no idea if it was because they were sharp and dangerous in the bag or because they were weapons? Perhaps next time. At another store we tried black soy bean tea, called kuromame in Japan and to be honest this is the only place I’ve seen it. The lady in this store was so friendly and welcoming and came over with samples for us both to try. I liked it but Drew being a loyal coffee drinker was less likely to be converted. Black soy beans are a legume native to China and used in Asian medicine to clear toxins from the body. It’s also suppose to help normalise body weight due to the polyphenols that are anti aging and support lipid metabolism in the body. It also contains isoflavones that are strong anti-oxidants and again promote lipid mobilisation. Another temptation to take home was a brick of dried bonito and a wooden plane for shaving it. 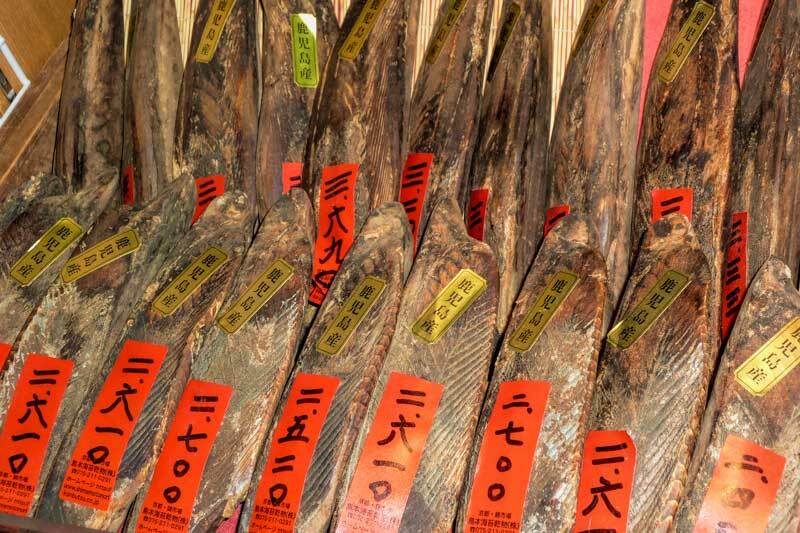 Curls of katsuobushi are shaved off the dried tuna fillets and are delicious with many Japanese dishes. Along with kelp (kombu) they are an essential ingredient in dashi and when piled on top of a hot dish like okonomiyaki or takoyaki they ‘dance’ in the heat adding an element of natural theatre to the dish. Being in it’s natural state, not packaged, I was almost certain I wouldn’t be able to bring it back into Australia. If you are looking for a food item to bring home some good quality sencha and matcha or the vacuum packed pickles are good options. It does need to be something that’s packaged and sealed. This of course is all the excuse you need to eat your fill of all the delicious foods while still in Japan. It’s a huge market with so much packed into each tiny stall. I can’t begin to list out everything but I can recommend the overall experience wholeheartedly. In balance, there were two of the taste experiences that were slightly less successful for us. One was the takoyaki, it’s a snack we both normally love when it’s served up fresh off the cast iron griddle but these were disappointing and under cooked, the batter was goey but not in a good way, and you could taste the raw flour. The other were the distinctive bright red octopus on sticks and stuffed with a quail egg. They look and sound really interesting but having by then been told by several people not to get them as they are so rubbery you can barely swallow them we decided against it. Now normally you might say just try it and discretely throw it away if you don’t like it but in Japan there are almost no rubbish bins in public places. It’s normal to carry your rubbish with you and dispose of it when you get home. I’m sure you’ll understand why I didn’t fancy egg and octopus in my handbag for the rest of the day. In hindsight I’ve decided I always regret more what I didn’t do than what I did but I can’t say I went hungry without it. 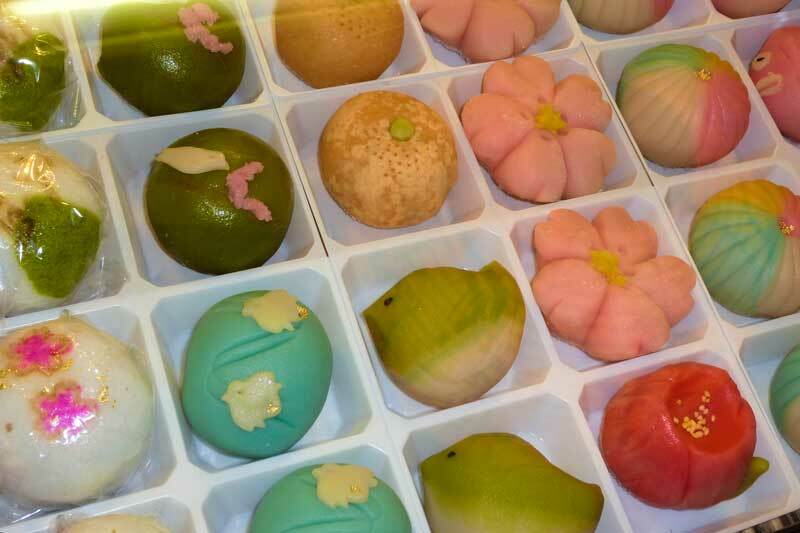 How gorgeous are these wagashi, a modern take on a traditional soft hand made sweet. They are often themed to the season like these spring ones and served with tea. Made of mochi they are filled with anko or fruits. The photos of giant tuna in Japanese markets are familiar to most of us but there are far more stalls trading in small fish and other seafood that is quite unfamiliar to me and just as interesting. The local vegetables included some that were familiar to me but many that I would love to experiment with, such fresh ingredients and vibrant colors are so enticing. And finally these. 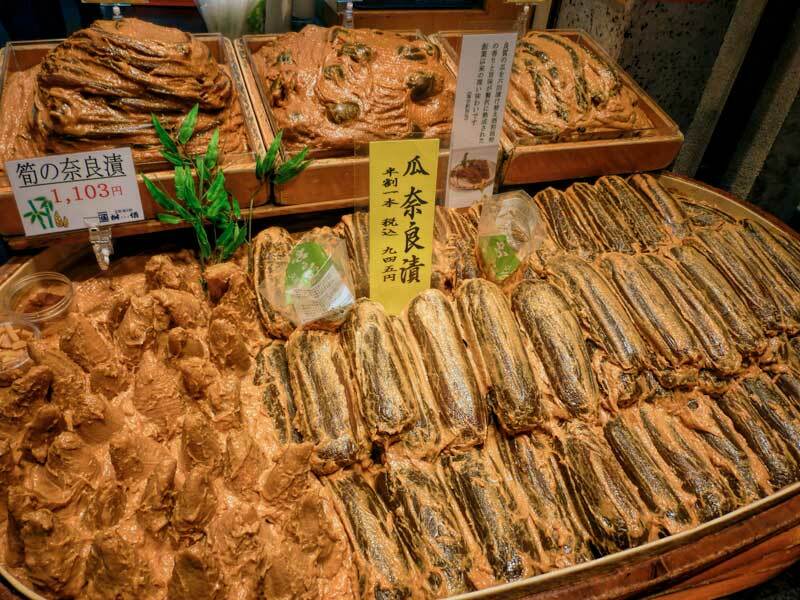 Misozuke are another type of pickle that featured prominently where the vegetable is preserved in the salty miso paste. Doing this at home you may rest them in the miso bed for between an hour and a day depending on the ingredients used but I’ve heard that some of the artisan pickles are done over extended periods of many months. If offered the chance to try them definitely do have a taste. Opening hours: Open daily 9 am – 6 pm. 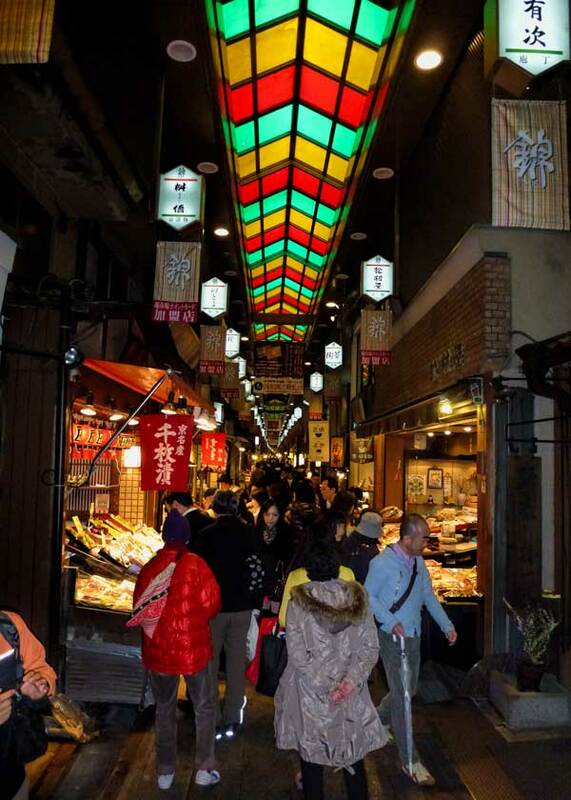 If you enjoy trying new foods and flavours I’d highly recommend wandering along Nishiki market at some stage during your visit to Kyoto city. Try some of the samples, buy a few tasters or stop in at one of the dozen or more small restaurants along the stone paved market street. Want to visit the market, meet the stall owners, taste the produce and learn about the local farm to market journey followed by a traditional style 7-course lunch? Market and lunch tours are available accompanied by a knowledgable English speaking guide who can answer your questions and fill in the culture and etiquette behind it all. >Looking for a great place to stay in Kyoto? We use and trust Booking.com for their great selection and value in Kyoto. >We regularly purchase the Japan Rail Pass. Here’s everything you need to know to decide if it’s worth buying for your trip. We also use an IC card such as the SUICA card daily on subways, buses and private railways. >Free WIFI isn’t widely available in Japan. For translation, directions, timetables and other information on the go personal WIFI is one of our essentials. We look at the options in our cheat sheet to staying connected in Japan. Do you have a love of mochi, a hankering for matcha or is there another Japanese food that tops your list? I’d love to know your favourite Japanese dish or ingredient in the comments below. Hello! Love your article about one of my favorite places in Kyoto. I checked a knife from Aritsugu off my bucket list in March and brought it back to Atlanta in checked bags uneventfully. My name is stamped onto the blade in katakana, making it a lovely heirloom! Beware of the sharpness! I cut myself the first time I used my knife and disn’t Even know it until I saw blood! PS Had the octopus with the egg and while good and a novelty for a photo, not the most delicious thing i’ve Tasted:). Worth the cost for the photo! It’s such a great place to wander around, we always find ourselves back there several times when we’re in Kyoto and always find something new and fun to try. Congrats on your knife purchase, so hard to decide isn’t it, even if you go in knowing exactly what you want the choice is overwhelming. Hey there, I bought a knife at Aritsugu and it was stamped with my name in Japanese then wrapped beautifully in a box. I then put it in my suitcase and flew Osaka to Narita and later Narits to Melbourne with zero issues. Its the shapest knife i own and is awesome to use! Thanks Kieran, we’re planning to head down there and get one when we’re back in Kyoto in November. Thanks Jasmine. I’m heading back to Japan today but not to Kyoto this time. I’m hoping to have lots of lovely fish and seafood in the north while enjoying the sights. Will be back in Kyoto in November and Drew’s really keen to pick up a good kitchen knife at Nishiki for filleting and preparing fish this time so I will need to remember to update this post with how that goes. I tried fresh Sakura mocha last year in Fukui. It’s now superseded red bean mocha as my number 1 favourite! That’s quite a comprehensive post, I feel as if you need to spend the whole day there! Thanks guys, I will be in Kyoto to celebrate the end of the year and would love to do the market tour on the 31st of Dec, but I reckon it will be crazy packed… Can’t wait to follow your tips to do the most of the market! Do you guys recommend an area in Kyoto to stay for 4 nights in New Year? Any particular place to be on the night of the 31 of Dec? We would do a few of the day trips you mentioned, and we are looking for options on Airbnb, but it would be great if you can tell us an area to use as base! Hi Mario, as much as I love Kyoto it is usually packed. You will probably find some stalls in the market are closed right on the New Year as is the case for many businesses as it is very much a family holiday. There is some more information on New Year in Japan on this post http://www.2aussietravellers.com/japanese-new-year-traditions/. I would wrap up warm and head to a Buddhist temple known for Joya no Kane (temple bells celebration) on new years eve. We prefer to stay either near Kyoto station for easy access especially if we think we’ll be doing a lot of day tripping and with early starts or late return. Alternatively we stay centrally to be close to restaurants, attractions and not too far from a subway station. Budget and what you’re priorities are to see will influence your choice a lot. Have a wonderful trip. I loved that market (and the Daimaru food hall!) I was particularly interested in your description of the Misozuke…as I remember them distinctly and they looked quite unappealing! This looks so interesting! I love mochi so I am super curious of that grilled one and those gorgeous wagashi! And I also food markets so will definitely take my time to this place when I finally plan a visit here! What a fantastic post! I have been to Kyoto a few times, but never to this market – a return visit is most needed (and I’vejust started planning) Shared, and looking forward to reading more of your blog. I always love to explore such markets wherver i visit. They give a peek into histroy, culture and traditions. I loved your article in totality. Thanks for sharing. I LOVE this article and not just because I miss Japan, but because this market looks incredible. 6 blocks of goodness filled with seafood, traditional bean cakes and history. I’ve never been to Kyoto, but it’s on my list and I didn’t know it had a market quite like this. I love how detailed your post is! Thank you for including a map, it will make it a lot easier to find. I can’t wait to go to Japan and try the food. I love that so many vendors allowed you to try samples of their food too. It sounds like such a fun and yummy way to spend an afternoon! Even though I’m not particularly adventurous when it comes to food, I do love to walk through the markets and try a few things just to say I did. Any times, particularly in Asia, I’ve been surprised. And who can turn down a beautiful dessert offering? Wow! I’ve always admired businesses that survive 2, 3 generations but 7 or 8?? That’s crazy! Anyways I wonder what black soy tea tastes like – because in Malaysia, soy drinks (incl. black soy) are “considered” more like milk, some even take it as milk replacement. The Malaysian black soy milk sounds interesting, I’d like to try it, this was the first time I’d seen soy beans that weren’t a creamy white colour.. I think the difference is that the Japanese version steeps the beans like you would a normal tea and removes the bean before drinking. For soy milk you normally blend the soy bean with water and strain through something fine like muslin cloth so it contains a portion of the bean solid making it more creamy and opaque. Nope definitely couldn’t bring them in and wouldn’t try but it is strange the things that can and can’t be imported. For example even the importers haven’t been able to bring kombu (kelp) into Australia for several years now and it’s a basic ingredient in many stocks and dishes. I’ve not eaten a lot of authentic Japanese, so there’s some new things still left for me to try. Great summary of this market too. I spend more time in markets when I travel than in any other place. I just wish we had permanent markets such as this in my home town. I’d be there all the time. I love markets!!! Thank you for this in depth post. I feel like I was walking through the market with you. So many colourful sights and sounds. The mochi sweets look amazing. 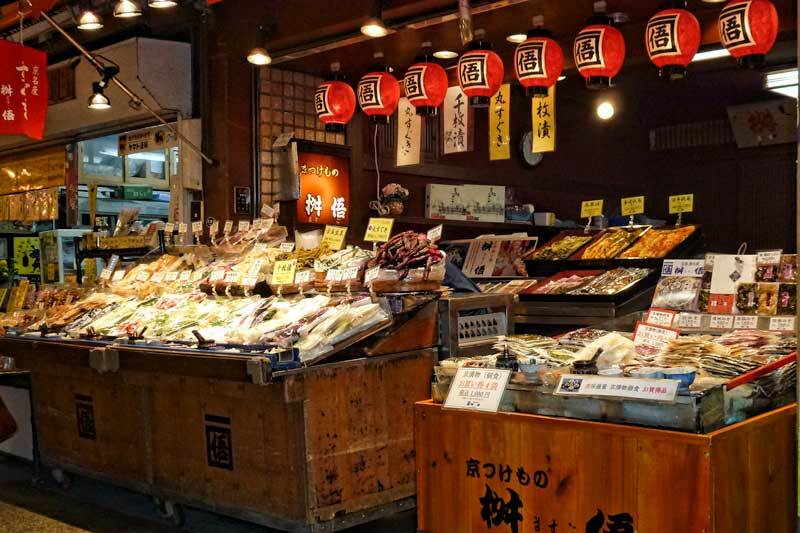 I have been to Kyoto a couple of times, but never went to the Nishiki Market. Another great reason to go back! 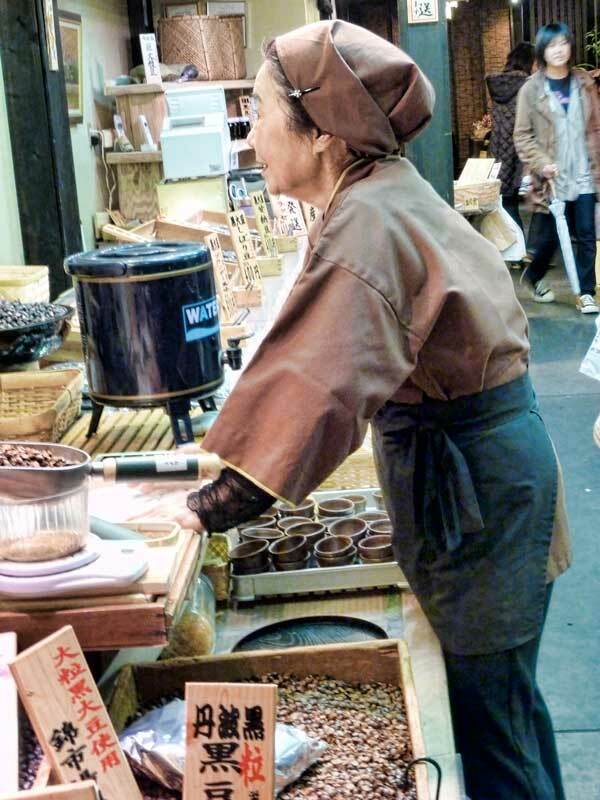 Thanks for sharing such interesting details about the black soy beans and Nukazuke method. 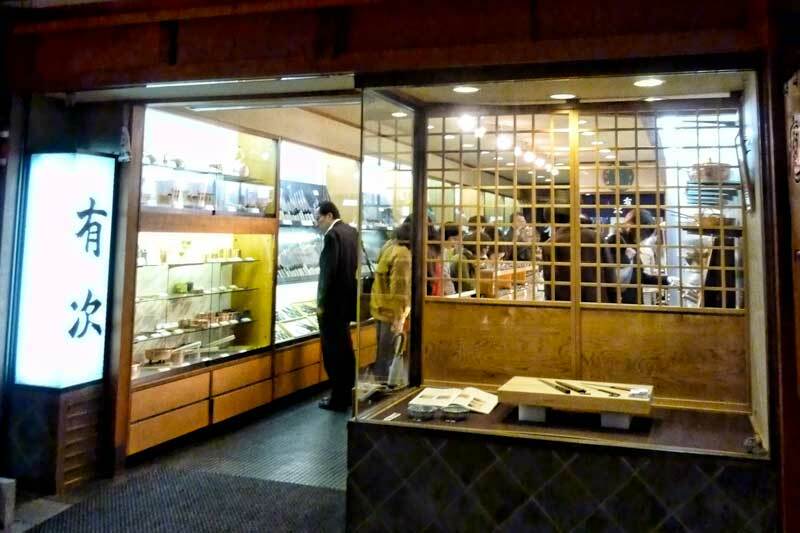 I would love to sample lots of the food there, especially those adorable wagashi mochi! The shops of that market is looking so beautiful, design of products is looking so good and food is looking so delicious and yummy.